As the design of PCBs evolve, the need for higher power desoldering tools with a wide arrange of nozzle configurations grows. The HAKKO FR-410 provides 140 watts of power and has the widest selection of nozzle configurations that can meet almost every need. 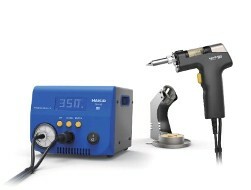 The station includes the same popular features from the HAKKO FR-400, which include an anti-clogging feature that helps ensure instantaneous application of peak vacuum pressure to the solder joint.  and a basic maintenance kit with a variety of basic cleaning tools and replacement filters.